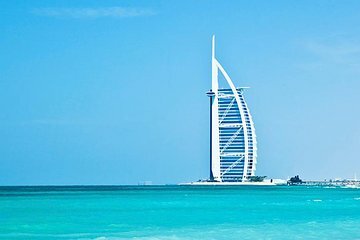 Enjoy the views from the Burj Khalifa, high tea at the Burj Al Arab, and a tour of modern Dubai as a bonus. This tour fantastic, people very friendly and knowledgeable. We enjoy the Mall and the view from Burj Khalifa. Also the Burj Al Arab what we was waiting all day to see what will be look like. As we arrive to be seated in the lobby lounge the lady was make us so much to wait and she was not a very friendly and bubbly hostess. She make us to seat where no view whatsoever. So we have to ask someone to place for us for a better view. Service was slow for that 1 12hour, also the view just to see through the window and browse through that floor. But the afternoon tea, the 7 course was just outstanding. 2 étoiles!!!!! Pourquoi? Parce que le guide , langue française, nétait pas au rendez-vous!!!!!! Par chance nous avons pu suivre la visite avec le groupe italo-espagnol du jour grâce a leur guide qui , elle, parlait français et qui a bien voulu nous accepter !! La visite était intéressante et a répondu a nos attentes. The modern Dubai tour was good, taking in the Mall and all the fishes and the Burj Khalifa. The afternoon tea at the Burj Al Arab was spoilt by only having 1 1/2 hours there. It takes at least two hours to enjoy the afternoon tea. We had to leave all the last course of cakes to go for our lift back to the hotel .... the Burj did not rush it was all very relaxed.......... but we had to rush and it spoilt it its a 2 hour duration to enjoy properly. The tour was fantastic and the tour guide was great as well, very friendly and knowledgeable. Afternoon Tea at the Burj Al Arab is a must!